Whitney Houston delivers an incredible rendition of "One Moment in Time" at the 1989 Grammy Awards. Photo property of the Grammy Awards. Next Sunday, music’s best and brightest singers and musicians come together to honor the best in the recording industry. Adele, Bruno Mars, Nicki Minaj and Paul McCartney are among the big names that will take the Grammy stage to perform. Before they take the stage, here are several artists that performed outstanding performances from previous Grammy ceremonies. Lady Gaga opened the 2010 Grammy Awards with her monster hit “Poker Face” that featured incredible vocals and terrific dancing. Next, the Mother Monster performed a fusion of “Speechless” and Elton John’s “Your Song” with the British Piano Man himself. The 48th Grammy Awards paid homage to R&B/Funk legendary group Sly and The Family Stone. Many artists including Fantasia, Joss Stone, John Legend, Maroon 5 and Aerosmith’s Steven Tyler and Joe Perry participated in the number. Besides the incredible performances, one of the highlights included Sly Stone joining the fun on the stage. Sometimes it takes a simple stage and the pairing of two astonishing singer-songwriters to create a Grammy Moment. This collaboration is no different. Phil delivers a beautiful melodious song with the help of David Crosby. Five rap stars joined forces at the 2009 Grammy Awards. From a pregnant M.I.A. performing the backing vocals, each MC threw down their each gauntlet at the audience and launched their individual lyrics to highlight their different styles. 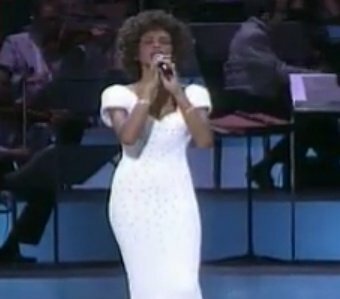 Whitney Houston performed the 1988 Summer Olympics anthem at the 1989 Grammy Awards. This performance featured flawless vocals and sealed her place as one of popular music’s most powerful voices.